Visual effects on various cards. Tested on a 64-bit WINE prefix, on Windows versions 7 and 10, with the only change being added corefonts (which most likely didn't make a difference positively nor negatively). Couldn't notice any difference in stability or performance from a native Windows 10 install within the actual game. Show Ubuntu 16.04 "Xenial" amd64 (+ variants like Kubuntu) Jan 07 2019 4.0-rc4 Yes Yes No Platinum M. O. 1. Use 4.0 to launch the installer. Install the game. 2. Use wine 4.2 to launch Battlenet. With intel and Ubuntu 16.04, the game runs very well - but after upgrading the hardware to AMD (details of new hardware here: pastebin.com/WukBAhhv ), I cannot make this game run in recent distros (with kernel 4.15+, maybe? ), like Ubuntu 18.04 or Manjaro 17.1.10: I'm stalled in a black screen after game launch, with or without the "-force-d3d9". As say Gruik Hearstone use alot CPU and even disabling hardware accceleration not help me. But I test it without -force-d3d9 (use less CPU) and with -force-d3d10 (use same as -force-d3d9 but without graphics). There are missing steps in the installation procedure (or is it because i use PoL ?) : the game crashed on startup. After searching a little, i realized it may be caused by missing libraries (possibly .NET). So, using PoL configuration, i installed randomly dotnet40 and vcrun2013 ; and then it worked. Note that it switched windows version to XP, so i had to switch it back to windows 7. Then there was another "problem" : the game was really nice and smooth graphically but CPU usage was real high (53% and more only for the hearthstone process, which is more than 2 full cores), it felt like my laptop was going to die with fan full speed and temperatures really high. After searching a little, i thought it was due to the absence of vsync (a lot of topics exist on how to disable it but not on how to enable it), i tried various configurations in the games' "options.txt" but didn't change anything. There is a new problem with the latest battle net version. It seems like Blizzard thought it was a good idea to make DirectX11 now mandatory for the Blizzard app. 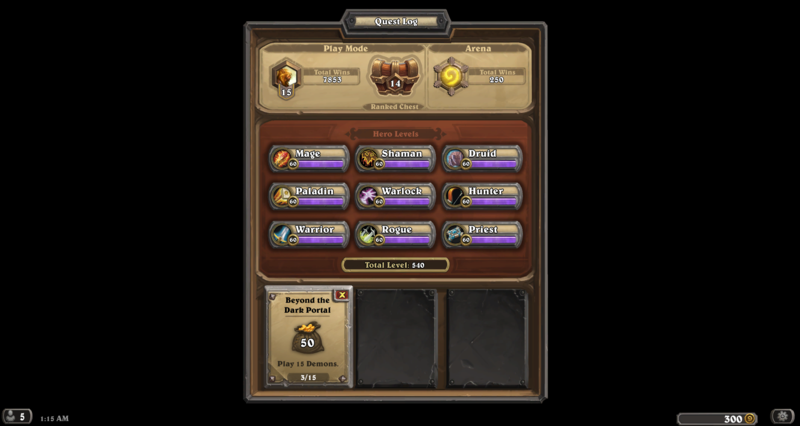 However this leads to huge problems in hearthstone. The only temporary solution is to delete the Battle.net.9737 and just load the old version. Does anyone have a better solution? In wine configuration don't disable d3d11, this will allow the Battle.net launcher to start. Then within the blizzard app, set the Game Settings for hearthstone to have the additional command line argument "-force-d3d9"
DON'T follow the instruction made by puargs. Especially this line is bad "rm -r ~/.wine" You will lost all Windows applications that you have already installed via wine. Don't do it. It is not necessary. Here is the right instruction. 2. download installation file from playhearthstone.com. 3. go to the folder with your instalation file. locationapi and change to disabled. 7. in staging tab enable all options besides the last one. 8. run it and enjoy. There is a mistake in point 6. Be careful following these steps - they are intended for brand new installations only. If you already have wine, don't delete your whole .wine folder as in the steps below. go to graphics tab, uncheck "allow the window manager to decorate the windows"
go to libraries tab, add "d3d11" and edit it to "DISABLED". 5) install battle.net "wine Battle.net-Setup.exe"
8) FINALLY, open battle.net application and hearthstone and it should run fine. Fireside gatherings work, but my location is wrong. I managed to log into one from home, and get Nemsy Necrofizzle. The feature crashes my game. Verification, needed. This is very new (1 June) so I'm not surprised that there are problems. * Fixed issues that could prevent Deck Importing from functioning on mobile devices. * Fixed an issue that could cause a player to get stuck in their Collection Manager after copying a deck. It's possible there are still more bugs or maybe you checked before this patch. Personally, I did a simple test (with windows set to xp, 7 and 10) copying and then creating a deck, even edited the clipboard and it all worked. Hearthstone exits after the start. RE: Hearthstone exits after the start. I had a similar problem and solved it. My problem was a crash only when connecting to the server (Europe) where I used "fireside gathering"; the game worked fine when connecting to the other servers. This problem might be the same as bugs.winehq.org/show_bug.cgi?id=42845 but I used a different solution than suggested there. same issue, seems fixed when i switch to low graphics quality in game options. I read that elsewhere too but it did not work for me. Just tried this without any luck - same problem, game remains completely unplayable. Can confirm. Tested tonight on 2.8-staging in a 32 bit prefix with wine configured as both XP and Win7 and behaviour was reproduced. Strangely it only came up after the end of the first full game I played but I think the update came in during the game and kicked me. Once I reconnected the problem popped up at the end of the game. I can confirm this happens to me as well. A small workaround I found to make the game 'playable' is to change graphic settings to low. Also easy to reproduce by hovering over the played card history, which is now completely black before it would just darken/desaturate the board. Experiencing the same. on this patch version. Ubuntu 17.04 w/nvidia 630M (driver v.375.66). I've attempted switching wine versions between v1.9.18 - 2.9 along with various DLL overrides without success. Same here, looks like the patch is causing hearthstone to use directx11. Tested with with 2.7. I also tested with 2.9 and installing dirextx11 via winetricks. I was able to get a game to work, but every time since, I still just get the black screen. The same issue. Nvidia 381.22, Wine 2.9. Someone with AMD GPU with the issue? fixme:d3d11:d3d11_immediate_context_ResolveSubresource iface 0x14ba2c, dst_resource 0x11937968, dst_subresource_idx 0, src_resource 0x8a36cb0, src_subresource_idx 0, format DXGI_FORMAT_R8G8B8A8_UNORM stub! I just found a workaround for this issue: In wine config > Libraries, add: "d3d11" and then, deactivate it. This will make the game work again without any issues. Can confirm that this works w/ Wine 2.7 in a 32-bit prefix: Game works as it did prior to the patch. Yeah, sorry, I forgot to say I'm using wine 2.9 staging in a 32bit prefix. That is so weird because that was the first I tested because of the DirectX11 errors and after the patch it did not work. Now it works!? I can also confirm that this works for my config as well. Ubuntu Mate 17.04, Wine v2.7, nVidia 630M GPU w/ driver v375.66. If you've already installed 'd3d11' and other things and then cleaned up all those tested configs add it back in and set it to 'disabled'.